To celebrate the launch of BRT's awareness campaign for the improved National Radio Network, (NRN), Princess Elettra Marconi flew in from her home in Italy to name the last of BRT's four locomotives in honour of her father, Gugliemo Marconi. In a ceremony at Marylebone Station on September 12, Princess Elettra unveiled the nameplate. Accompanied by her son Guglielmo, who inherits her father's name, Princess Elettra said she was very pleased to have been invited to name the locomotive and that she and her son, looked forward to carrying the name of Marconi in the continuation of the work he started many years ago. 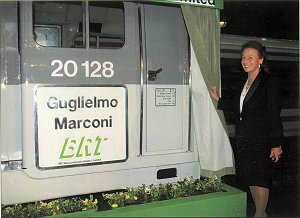 Picture: Princess Elettra Marconi unveils the nameplate of the BRT locomotive in honour of her father, the great Italian wireless pioneer Guglielmo Marconi. Chief Executive John Drake addressed guests from the BRB, Railtrack and rail businesses on the importance of the NRN to the safe working of the rail industry. Mike Satchwell, BRT's Business Manager, Mobile Communications, together with Nigel Gray, Product Manager, Radio and Tony Hines, Customer Engineer, Radio, were on hand to demonstrate the unique features of the Brunel radio and NRN. Speaking after the ceremony, Mike Satchwell said: "This event has built on the exposure gained at Manchester's Infrarail 94 exhibition and generated interest with the rail businesses on the role that the NRN can play for emergency planning and incident management. MARCONI was born in Bologna, Italy, on April 25, 1874. At his father's country house, Villa Grifone, Marconi embarked on a series of successful experiments using the Hertzian wave theory for wireless communication. In 1896 he moved to England and took out the world's first patent for wireless telegraphy. On December 12, 1901 Marconi transmitted the first transatlantic wireless signal; three dots of the morse code 'S' were sent from Poldhu in Cornwall to Marconi at Signal Hill, St John's, Newfoundland. Marconi received many international honours for his pioneering work in wireless including the Nobel Prize for physics in 1909 and the Knight Grand Cross of the Royal Victorian Order. Struck down with illness, Marconi returned to Italy in December 1935 never to leave again. Marconi died on the July 20 1937, his body being laid to rest in the mausoleum in the grounds of Villa Grifone. Of all the many tributes that followed, the greatest and most appropriate gesture was the closing down for two minutes of wireless stations throughout the world. The 'ether' was at quiet, as it had been before Marconi. 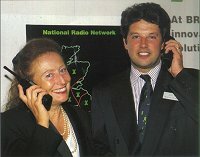 The National Radio Network (NRN) was developed specifically for the operational railway; it provides radio coverage for 98% of the rail network through500 base stations and 21 radio exchanges. The NRN offers full access to the BRT telephone network; public service telephone network (PSTN) dialling, including international, is also available. 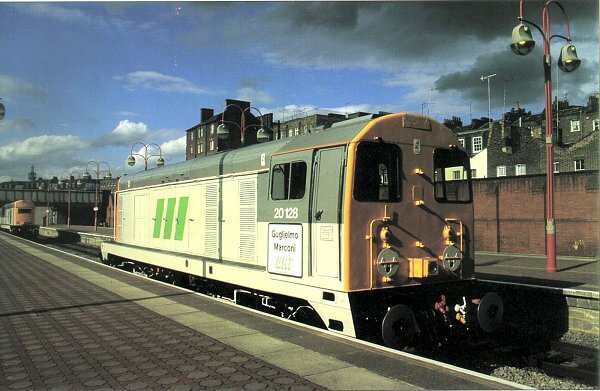 It can provide 'dedicated' open channels on talk-through mode for incident management and an override priority facility to ensure that all emergency calls are immediately connected to the railway's Train Control Offices (TCO) and Electrical Control Rooms (ECR). The article above from BRT Newsline November 1994, Issue No 15, is ©1994 BR Telecommunications Ltd.